We extend a warm welcome to all who visit the Church of St. Andrew the Apostle! Services are Sundays at 8:00 and 10:30 a.m. Communion is offered at both services. Sunday school begins at 10:30 a.m. from September-June. Upon entering the church, you will be greeted by our ushers. The ushers will provide you with a bulletin which lists the order of the service, the scripture readings, the hymns we will sing and other important church information and news. You are welcome to take a seat anywhere in the church or the ushers are happy to help you find a seat if you prefer. In each pew there are several copies of the Book of Common Prayer and the Hymnal. During the service, the minister or lay assistant will refer to the pages in the Book of Common Prayer (the pages are also listed in the bulletin). The hymn numbers are posted on the wall to the right of the altar and are listed in the bulletin as well. After prayers, the scripture readings, the gospel and an uplifting sermon, we recite the Nicene Creed, pray for those in need and welcome our youngest members (ages 3 through 6th grade) from their Sunday School classrooms. We greet our friends and neighbors with a sign of peace – simply shaking hands and saying “peace be with you” provides a warm reception to all. The ushers pass a collection plate and our minister celebrates the Holy Eucharist (communion). We recite or sing the Lord’s Prayer before we partake of the bread and wine. All baptized Christians are invited to participate in communion, no matter your denomination. If you would like to receive, our ushers bring one row of parishioners to the altar at a time, starting from the back of the church. At the altar, you have the option to kneel or stand when you accept the communion wafer from the minister. The lay assistant will follow with the wine. You may either dip or touch the wafer into the wine or sip from the chalice. If you do not want to accept the wafer or the wine, but would like a blessing, you are welcome to approach the altar and cross your arms over your chest. The minister will give you a blessing. 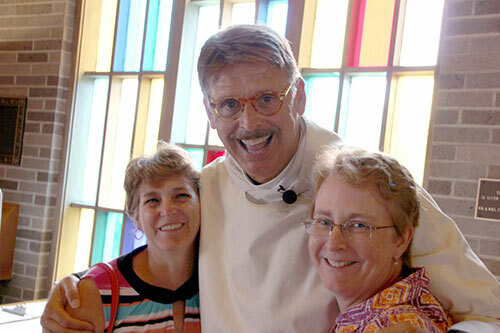 When the service has concluded, a friendly member or two may greet you and welcome you to St. Andrew’s. You may wish to sign our guest book near the church entrance/exit and meet our pastor while leaving the church. All are welcome to enjoy fellowship and goodies at our coffee hour following the 10:30 a.m. service.